The movie Invictus?? (Latin for Unconquered) gets its name from the following poem by William Ernest Henley, which Nelson Mandela had written on a piece of scrap paper during his imprisonment. 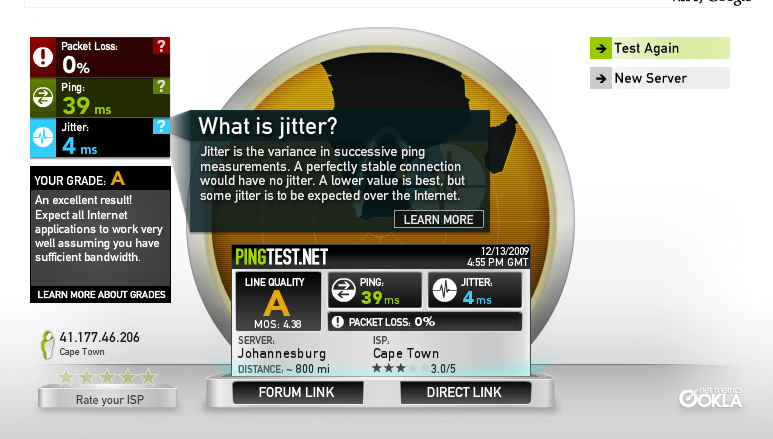 The comparison is not “fair” in a sense, as Afrihost clearly states that they offer Shaped bandwidth. What is often not said about Shaped Bandwidth is that it only really helps with cached websites. So you’ll be fine when reading CNN.com, but reading your online email or doing online banking is a different story. A few months ago, Skyrove signed a deal with Cybersmart that involves getting their bandwidth at preferential prices. They don’t classify their bandwidth as “shaped” or “unshaped”, as they’re not using traditional SAIX bandwidth. So it looks pretty erratic! I haven’t seen this kind of result before, and didn’t test again at a different time period to see if it’s a general problem. Both ISPs are ‘A’ graded (excellent), as expected, for local ping. For gaming, it’s generally recommended that you have a sub-60ms ping (to the gaming server). Provider the gaming server is in South Africa, you shouldn’t have problems using either Afrihost or Cybersmart. Afrihost’s Shaped offering gets ‘C’ graded here. “Acceptable. Your VoIP quality will suffer some, and you will have a disadvantage in online games. Test again to confirm” So basically: Forget about online gaming or having any business teleconference calls via Skype. There is a BIG difference between Shaped & Unshaped bandwidth, both as far as speed & price is concerned.Unshaped internet may be more expensive, but if you use it, you’d find that the “experience” of internet browsing is just as good as using it in the US. They are so different, in fact, that it should be compulsory for ISPs who provide shaped bandwidth to always append “Shaped” (or even better: “Basic”) to the end of their DSL product name, rather than hiding it away in the FAQs. Labeling would be a start, but even better would simply be to ban Shaped bandwidth overall. It’s a deliberately crippled service and is likely done (by Telkom) in order to overcharge for Unshaped bandwidth. 1. DISCLAIMER: I work for Skyrove and Cybersmart is a shareholder. These tests are not independent and weren’t peer reviewed (before we have claims of BandwidthGate). Proper testing would involve testing from multiple locations, servers, ISPs, times. 2. Skyrove does not sell DSL packages, but we use DSL at the vast majority of our WiFi Hotspots. 3. All tests were done around 6 pm on a Sunday. Results will vary during the week during working hours. Just signed up for an Afrihost account. The sign-up process was quick & painless.?? However, before my account can be activated, I have to send a copy of my ID. Luckily, Afrihost allows me to upload it through their online portal.?? Even so, I see RICA as a human rights offence. All I'm doing is "talking" using bits over copper & fibre lines, as opposed to using words over sound waves as I would in a normal conversation. It would be ludicrous to expect me to register with my ID before communicating with another human being, so why do this when using a different technology to do the exact same thing??? 2. It shows the lyrics! Awesome!?? 4. Looks like they're (currently) the underdog. The hype has been around Last.fm, Pandora & Spotify. JukeFly is slightly different, yet every bit as good!?? 5. It works just fine in South Africa. No bizarre country restrictions or Digital Apartheid being applied.